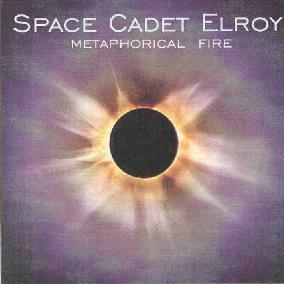 Space Cadet Elroy - "Metaphorical Fire"
At some point on Saturday afternoon at Strange Daze 2000, one of my customers at the Aural Innovations table handed me a complimentary CD (of his own making I surmised) and meekly suggested I take a listen. I thanked him and promised him I'd give it a thorough listen, and I imagine that I also promised a review here on A-I.com. Well, I hardly feel now like I'm writing this just to fulfill a promise... I'm writing this because this is really an excellent CD!! Jeff Breidenbach is the guy's name and he's from Tiffin, Ohio in the northwest quarter of the state, and supplies nearly all the instrument parts (keyboards, guitar, bass, and drums) and vocals. At 23 tracks and just a hair short of 80 minutes, this is more like two full albums worth of great space rock music. You can't spell (Jeff's pseudonym) 'Elroy' without 'Eloy' and 'Metaphorical Fire' has an epic synth-heavy sound that in some ways recalls that venerable German band. I was really pleasantly surprised to hear an album of such spirit and accomplishment sprouting from right here in the cornfields of Ohio. Jeff just needs to get to work on promoting himself (hopefully, this review is just a beginning) and finding his audience. He also needs to figure out how to clone himself so he can play this stuff live. After being transfixed back into a state of "Suspension," Breidenbach teams up with his first guest Max Jones, who displays a phenomenal light touch on the guitar during the stunning "Above and Beyond." And if you had any doubt about the drumming, "Yes they're real...and they're spectacular" to quote Lois Lane (or at least the actress that played her on TV). Breidenbach wins huge points from me not only playing *real* drums, but playing them pretty darn well - keyboards seem to be his forte, but this album is very well-balanced. His engineering partner Scott Freeze steps in to guest on bass for two of the next three tracks ("Finding Time" and "What Was I Thinking"), and also puts forth a first-rate performance. These guys can all play. "Cetacea" is Breidenbach's own personal display of multi-dimensional chops, from the impressive piano soloing to the droning guitar riffs to the gurgling synths...it's all there. If you like the more experimental synthesizer music, then that's what you'll get with "DSP." 'Metaphorical Fire' doesn't run out of steam either...the one-man orchestra peaks out with the instrumental "Resolution" and then eases off with a subtle revision of the upbeat opener ("Pyre One"), called "End Pyre" this time. Oh man, this presumably-insignificant little homemade CD-R is one of the most professional-sounding, well-written new albums I've heard this year. Now let's review... so far I've mentioned Eloy, Nektar, and Roger Taylor... three names a thousand times more famous than this guy. But honestly, this album not only sounds like an amalgam of those artists, it's just as much fun to listen to. Weeeelllll, almost just as much. Needless to say, I recommend it whole-heartedly. Contact Jeff Breidenbach by phone at (419) 443-1710. One of these days, I think I'll give him a call myself and find out just what he's up to next. And see about how his debut (?) CD might get more exposure in the marketplace.